​Can't make the trip to Hawai'i to enjoy a lū'au with authentic entertainment? Sit back, relax and let us "take you there" during your next event! We can provide both female and male Polynesian dancers who can showcase dances from the islands of Hawai'i, Tahiti, Samoa, Tonga and New Zealand (Haka, poi balls). Hawai'i has the graceful Hula, while Tahiti has the fast hip-shaking ote'a beats. We can also get you in contact with male Samoan fireknife dancers who reside in the valley. 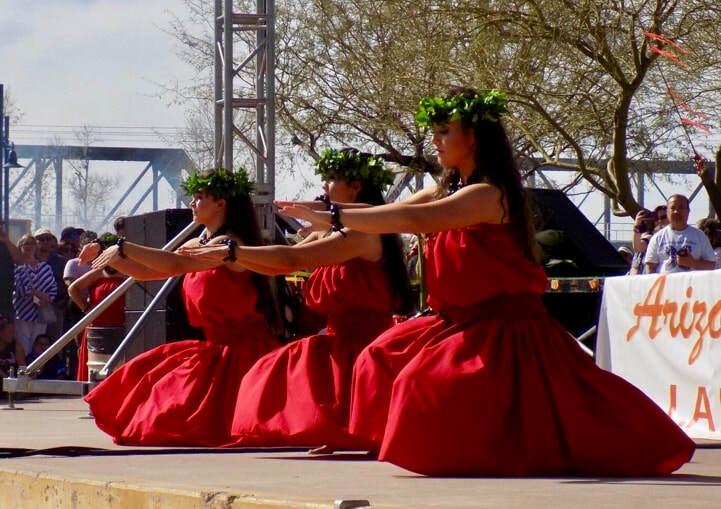 ​Our dancers can lei greet (leis additional), model for photo opportunities and more. The majority of our dancers are of Polynesian descent and/or were born and raised in the islands. Typical shows are 30 minutes for birthday parties and 1 hour for a full lū'au, but we have done events where some clients only needed 1 song total and some clients needed 3 hours of entertainment. Shows are customized for your budget, so we can work with you! We are also one of the few groups in the valley that has a full band of musicians. We have guitar, bass, ‘ukulele and percussion. Our musicians are also vocalists who can sing and play songs from the Polynesian islands, as well as Reggae and Oldies. Our lead musician has all of the sound equipment you'll need. We are open to taking requests and enjoy engaging the crowd. ​Have a stage, but don't know how to decorate it for the show? Let us take care of you! Our lead musician is also an artisan who carves and creates masterpieces out of various types of wood. He has wood and papier mache tikis, as well as silk tropical plants. Contact Rudy if you are interested in purchasing any of his works of art. He takes custom orders! Call or text him directly at 808-255-5767. Rudy also gives helpful, private ‘ukulele lessons for all ages in residential Chandler. Contact him at the above number to schedule. Our Creative Director, Nālani, gives group and private hula lessons to all experience levels age 5+ in Chandler. Please visit her website at www.hulainarizona.com for more information. ​We are very professional and have a Performance Agreement to sign once all details are finalized. We are licensed with the Town of Gilbert. We also carry our own business liability insurance. Contact us with all information about your event and we can book our performers for you! Let us help you to create the perfect event with authentic Polynesian music, dance and food!